HSE PINs report - conclusions and recommendations from the "Worker participation in health and safety: A review of Australian provisions or worker health and safety representation", HSE 2002. UK union UCU (formerly NATFHE and AUT) has produced a sample Union Inspection Notice book for reps to use. 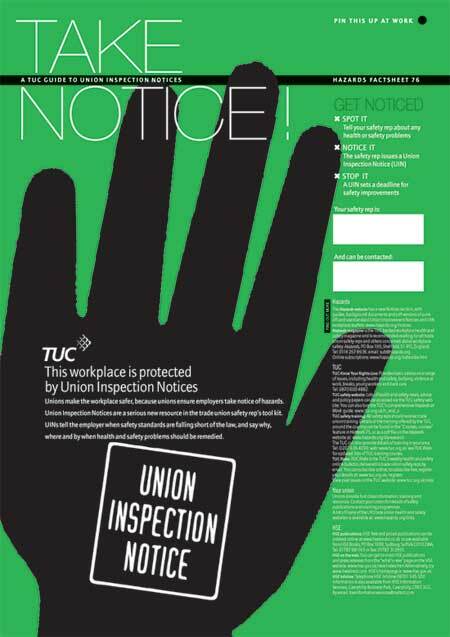 UK union Community (formerly ISTC) has produced a Union Inspection Notice book. Single copies of this 4 page TUC/ Hazards pullout guide are available free with a stamped addressed envelope from: TUC Publications, Congress House, Great Russell Street, London WCIB 3LS. Send an email to Hazards saying how many copies you require, and we will despatch immediately with an invoice. Standard letter to notify UNISON members that you are undertaking a health and safety inspection. 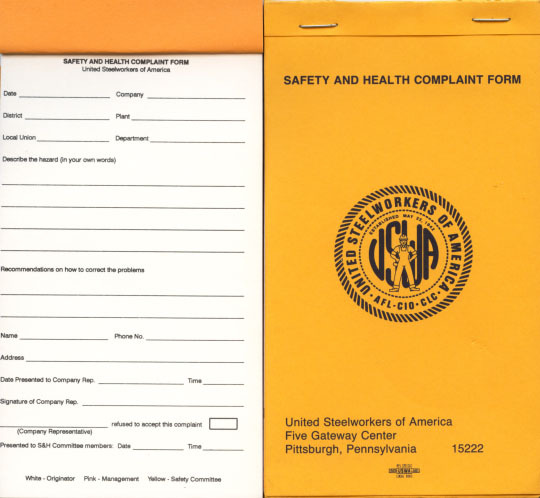 A United Steelworkers of America health and safety complaints form pocket book allows reps to make a safety complaint, record whether management accepts the complaint and provides three copies: white (for the originator); pink (for management); and yellow (for the safety committee). 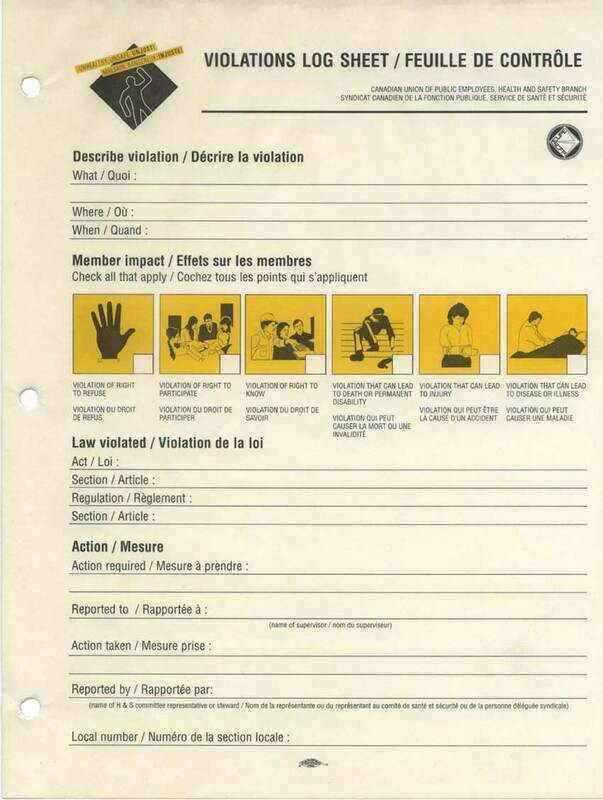 The Canadian Union of Public Employees produced a health and safety "enforcement log" as part of a campaign, "Health and safety enforcement - the weakest link". 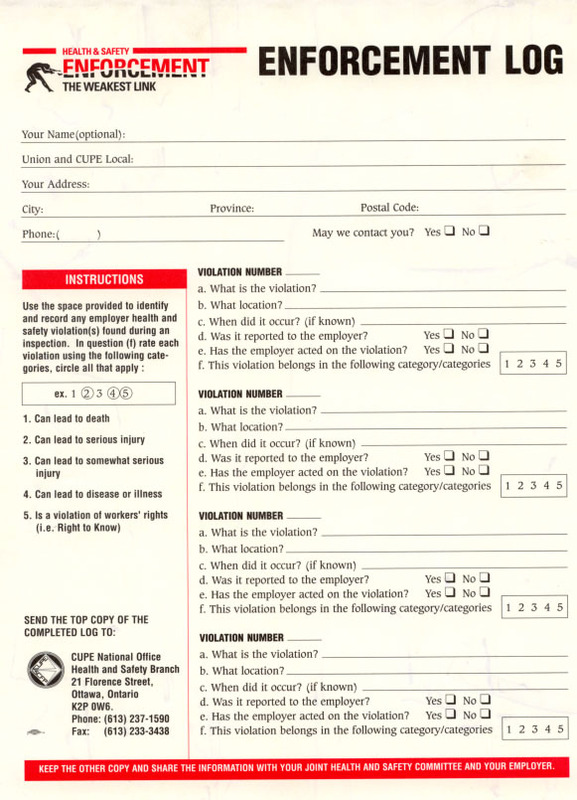 The form allows union reps to grade problems by degree of risk. A top copy is submitted to management. A carbon copy is for the union and joint health and safety committee. A PIN is a Provisional Improvement Notice which is a formal notice from a Health and Safety Rep to a supervisor advising the supervisor that there is a breach of safety at work. It is used where consultation between the Health and Safety Rep and the supervisor does not resolve the safety. PIN 'em down CPSU guide on Provisional Improvement Notices. 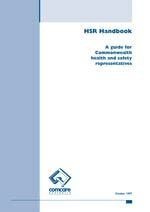 Health and safety reps' handbook Sections of the official Comcare health and safety handbook outlining the rights of health and safety reps in the Commonwealth (federal) sector, Australia. Excerpts here include detrails of the powers of safety reps, a model completed PIN, a blank PIN, and some background to the role and application of PINs. VTHC, the major union federation in the Australian state of Victoria has championed the use of PINs by union safety reps. This document describes how reps can use PINs to resolve issues at the workplace, when to use them and how to ensure that your employer does the right thing. The law in Victoria, Australia, gives health and safety reps the right to issue PINS if they believe there has been a contravention of safety laws. A PIN is usually issued to the employer, although it may also be issued to a manufacturer, supplier or any other person with duties under the Act. Before a PIN can be issued, the rep must consult with the person to whom the notice is to be issued. 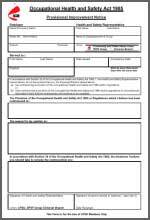 When an elected OHS rep issues a PIN to their employer, the employer cannot just ignore it. The two options are to comply with the PIN or to call an Inspector. But what happens if the employer does not comply with a PIN? A state government department in Victoria, Australia, that ignored an improvement notice issued by a union safety rep has been successfully prosecuted. The Department of Education and Early Childhood Development had ignored a Provisional Improvement Notice (PIN) issued by the safety rep.
Retail union Usdaw is to call for extended rights for union safety reps, including the right to issue Provisional Improvement Notices (PINs). A proposition backing the call for safety reps to have the power to issue the legally-binding notices to stop illegally dangerous work was passed at the union’s Blackpool conference. Britain: Safety reps should get noticed! TUC is urging union safety reps to make sure employers take notice of their safety concerns. A new online guide to union inspection notices says each one “is a formal notice issued to a manager by an accredited trade union safety representative. Melbourne's jumping season fell at the first hurdle when Sandown racecourse workers scratched the steeplechase from the card on safety grounds. Australian Workers' Union (AWU) members slapped a Provisional Improvement Notice (PIN) on heavy, outdated steeples that have led to cuts, bruises and back injuries. PCS reps have been using UINs to negotiate safety improvements - and sometimes just the threat of a notice was enough. Australia's Victorian Trades Hall Council has called for more prosecutions of unhealthy employers. The union body also urged safety reps to issue "Provisional Improvement Notices" where they see breaches of manual handling regulations. After a week of increasingly violent incidents culminating in a threat to take a member of staff hostage, PCS members employed as immigration officers have removed the threat to their safety by refusing to have face to face contact with detainees, as is their right under the Employment Rights Act in the face of serious and imminent danger. PCS last week served a Union Inspection Notice on Kevin Brewer, director of the Dungavel detention centre, "after a shameful five months of management inactivity, demanding that the appropriate risk assessments be done and a safe system of work be put in place." Companies and their directors and managers are to face closer legal scrutiny when they breach safety laws, says a new official policy. The Health and Safety Commission's new enforcement policy statement also recognises the role that warnings from safety reps should play in deciding whether to prosecute - giving official backing to the Union Inspection Notice process. Paragraph 40 of the statement says: "HSC also expects that, in the public interest, enforcing authorities will consider prosecution ... where following an investigation or other regulatory contact ... a breach which gives rise to significant risk has continued despite relevant warnings from employees or their representatives." Union reps in the rail union TSSA on Merseyside can now use Union Inspection Notices (UINs) as part of agreed workplace inspection procedures. Arriva Trains Merseyside accepted the TSSA's argument that the use of UINs by health and safety reps will complement existing company procedures. TSSA negotiations officer Steve Coe commented: 'This agreement not only demonstrates the invaluable work of union health and safety reps but that their expertise and contribution is being more widely recognised'. He added: 'All employers should be seeking to incorporate the UIN scheme into their existing health and safety procedures and supporting reps who want to enhance their existing skills and knowledge through extra training in UIN application.' 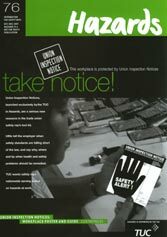 TUC's Union Inspection Notice scheme was launched in November 2001.